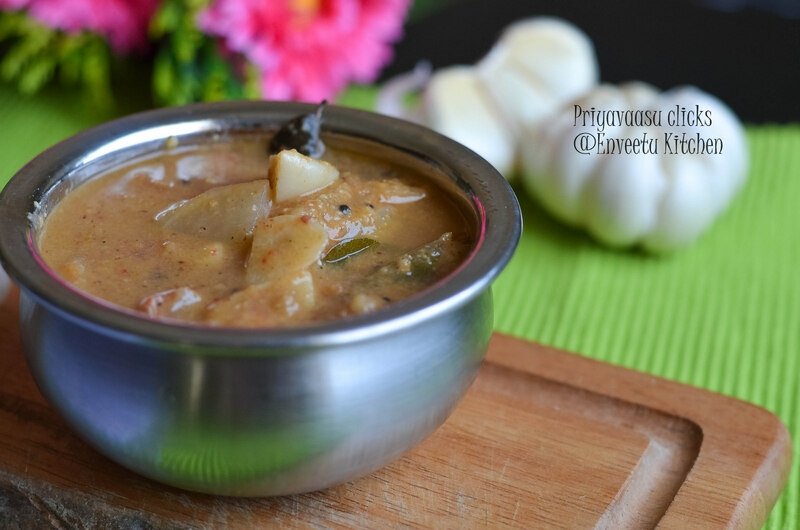 A simple gravy to go with steaming hot rice. Normally it is Dal tadka and subzi in our home. Coz, i pack either roti or any mixed rice for my hubby and me don't eat rice or roti. So, it is only during weekend's i get to make sambhar, rasam, a traditional Tamil Nadu style full meals. Last 20 days were crazy, Kuttu had practise everyday 3 hrs for a cultural program in his Arts Institute. We literally are going by his timings. Even on weekends he had practice, so this month i still haven't done my monthly provision shopping,sigghh!! With this crazy schedule, I m just relying what i have in my pantry. 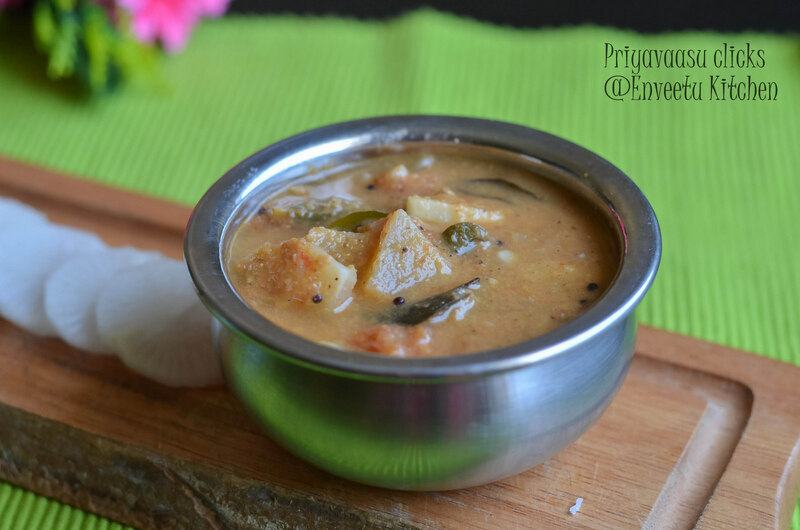 This Kuzhambhu was made the same way, i ran out of Sambhar powder, though i have all the ingredients to make it, i m not finding time to make it. So, i made a roast n grind masala, which amma makes in such situations and made this tangy kara kuzhambhu. I paired it with simple potato curry and rice. Wash,peel and cut the radish into roundels. If the radish is huge, i normally cut it vertically into two and cut each half into roundels, so each cut piece looks like a semi circle. Soak tamarind in warm water for 15 minutes and extract water around 3 cups. Chop tomatoes, peel the garlic and chop each garlic into two and keep things ready. In a Kadai/pan, add 2 drops of oil and roast the ingredients given under roast n grind except coconut and onion. Once done, let it cool for 10 minutes, then take the roasted ingredients along with small onion and freshly grated coconut in a small jar of your mixer and add 1/4 cup of water and grind it to a smooth paste. In the same kadai, heat oil given under tempering, splutter mustard seeds, add fenugreek, turmeric powder, hing, ajwain and curry leaves. Saute for a minute or two. Add chopped tomatoes, garlic and chopped radish to this and saute for 3- 4 minutes. Next add the ground masala and saute for 2 minutes, finally add tamarind extract to this along with a cup of water and mix well. When the mixture starts to boil, add salt. Let this simmer in a medium flame, until the rawness of tamarind disappears, and gravy thickens well. Takes around 20 minutes. Such a delicious kuzhambu Priya..I love our typical dishes for a sat meal..pic looks so inviting ..
nice tasty kuzhambu.. love it. Delicious kulambu recipe. Looks very inviting. 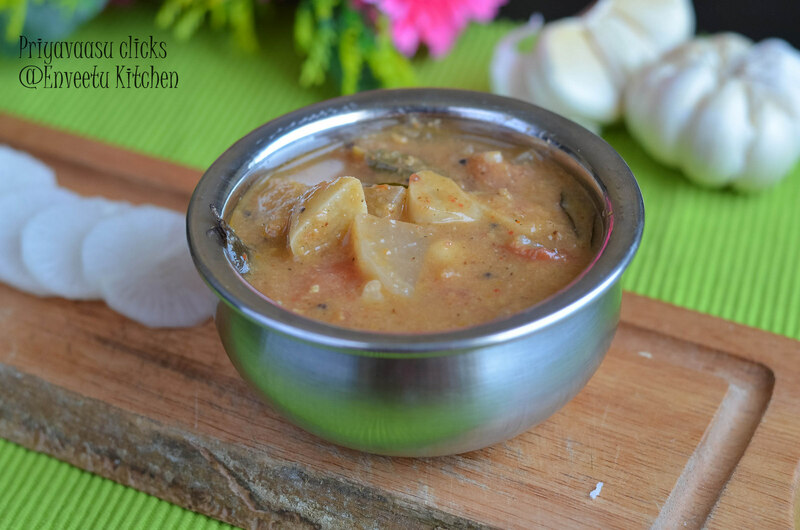 Freshly made sambar paste makes the dish so thick and flavorful.. sambar looks yummy.